The essential concept of an Accountable Care Organization (ACO) is to take responsibility for the care of a defined population of patients. There are a number of different ways that ACOs define that population. One way, perhaps the best way, is to start by defining primary care practice units. In this context, primary care practice unit can be defined as one or more clinic locations where one or more primary care physicians care for patients using common processes, common medical records, and where the physicians support one another such as through “covering” for each other during nights and weekends. 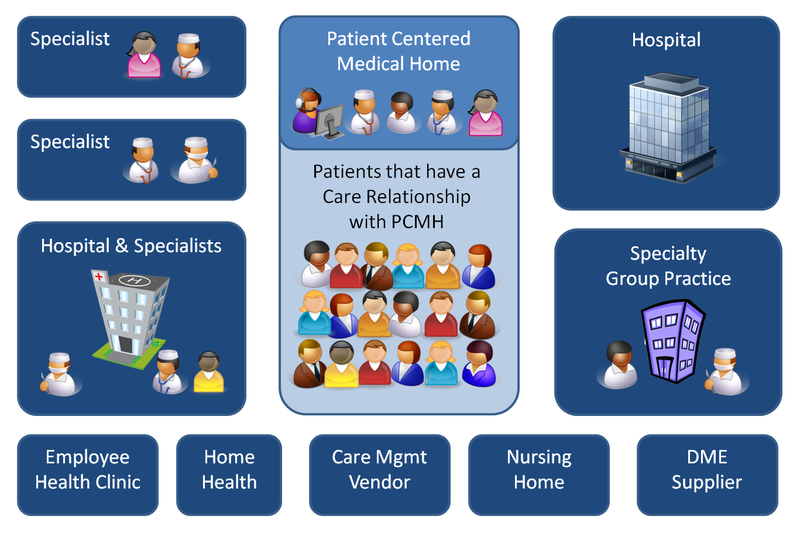 Many such primary care practice units are pursuing the vision of creating “Patient-Centered Medical Homes” — working as a team, including physicians and ancillary professionals, to provide proactive, holistic care to informed, activated patients and their families. 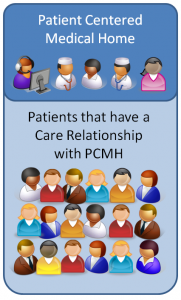 Then, the patients that have established care relationships with those primary care practice units can be identified, either by “deriving” the relationship based on analyzing available primary care encounter data, or by having patients and/or clinical staff explicitly “declaring” care relationships, or most likely some combination of both. In this manner, one can define the ACO as a collection of primary care practice units, and then define the population of patients for which the ACO is taking responsibility as the population of patients that has care relationships with those primary care practice units. This approach has been used successfully in a large pay-for-performance program and for the nation’s largest patient centered medical home designation and incentive program. Once the patient population for the ACO has been established, then the specialists, hospitals and other health care provider entities that constitute the ACO can be defined as those entities that provide a significant amount of service for the ACO’s patient population. The primary disadvantage of this “primary care-centric” way of defining an ACO is that the hospital facilities and specialists may provide a significant amount of service to patients from a number of different ACO patient populations. This is problematic when trying to structure performance-based contracts between health plans and hospitals, based on metrics that involve comparisons of the performance of one facility to another. Referrals of patients to hospitals are not random, but are influenced by the capabilities and reputations of the hospitals. Such referral biases are far too strong to be “adjusted for” using risk-adjustment methods that rely on commonly available insurance claims and laboratory data. Therefore, the best that can be accomplished at this point is to assume that all hospitals that provide service to the same primary care-centric ACO population share in the credit or blame for good or bad performance with respect to that population. In that manner, the performance of the hospital can be conceptualized as the weighted average of the performance achieved by all the ACOs served by the hospital, where the weights represent the proportion of the hospital’s ACO patients that belonged to each ACO. The same reasoning applies to specialists. More detail on alternative types of ACO organizational structures, and the roles of co-management relationship and hospitalists, is available here. The current state of the art in characterizing the care and referral relationships between patients, primary care physicians, specialists and hospitals is primitive. Reward Health Sciences will be seeking partners with whom to collaborate to further develop this technology.